Let’s be honest: There is no way to make pesky ingrown hairs glamorous. They just are what they are. Ingrown hairs form when hair follicles curl around and grown back into your skin instead of rising through it (I told you, not glamorous). One of the best ways to avoid these little bumps is to exfoliate regularly. I exfoliate my face with a gentle facial scrub every night before bed, and I use my Clarisonic a few times a week. I use a body scrub on the rest of my skin, or a loofah with shower gel. But no matter how meticulous you are with your skincare routine, ingrown hairs are almost inevitable, especially on the areas where you shave, wax, sugar or use any other hair removal method. Luckily, at our last photoshoot Team LC researched an all-natural ingrown hair treatment that is easy to make and gentle on the skin. And it smells divine, too. Mix all ingredients in a small jar or bottle (preferably one that can be sealed off so you can use your mixture later). Apply a small amount to affected area after shaving, waxing, or any hair removal and rub in until it begins to absorb. Watch your ingrown hairs disappear! This treatment works because the coconut oil is anti-fungal and anti-bacterial, yet moisturizing at the same time. The tea tree oil has major healing properties that can be used to fight infections, clear up acne, and reduce redness or irritation. 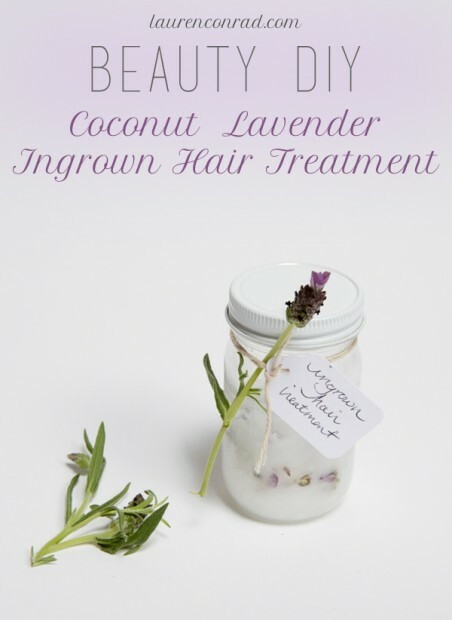 The lavender oil has a soothing, calming effect on the skin. And the mixture of all three smells wonderful. I hope you enjoy this ingrown hair treatment. Tell me if it works for you in the comments below! What beauty DIY would you like to see us post about next?